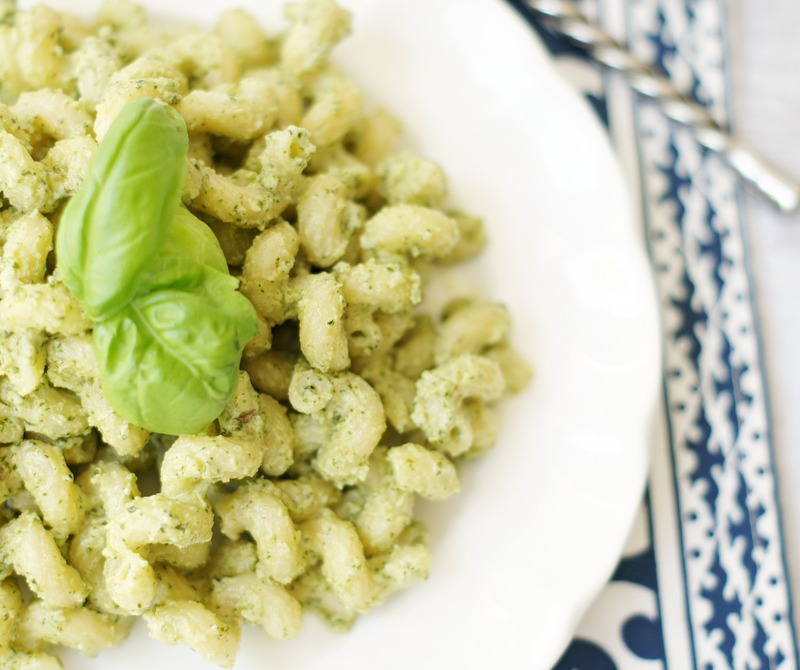 This Creamy Pesto Pasta will win the hearts of even your pickiest eaters. It’s so, so good and incredibly simple to make! Happy Monday! I hope everyone had a great 4th of July. We’ve been back from our Italy trip for 9 months now and from the time we came home I have had every intention of sharing some things about our trip . . .our favorite gelato places, our favorite restaurants, etc. But life happens and I haven’t gotten around to it. I also wanted to try and recreate some of the dishes we ate while we were there. I actually did manage to do that with a few of the dishes and am just now getting around to sharing one of them. This was one of my all-time favorite things I ate while we were there. It was delicious. Like I-wanted-to-lick-my-plate delicious. I came home and got to work and think I was pretty spot on with this. I have to be honest with you. I wasn’t sure this Creamy Pesto Pasta would win my boy’s over because, well, it’s got “green stuff” in it. They kind of had funny looks on their face when I dished it up, but they took one bite and then began shoveling it in. They couldn’t eat it fast enough and ate seconds. I didn’t post it when I made it months ago, but after them begging (seriously, begging) me to make it again, I finally did and am now sharing it. This stuff is so simple to make and so, so good. Trust me when I tell you that if my picky, picky Braydon loves this, then your pickiest eaters will too. Taylor finished off what tiny bit was left for lunch the next day and Parker was soooo not happy about that. Right now Trader Joe’s has the most beautiful fresh basil plants for really, really cheap. I just keep it in my house by my kitchen window and it lasts for months. I am so in love with fresh basil. Maybe that’s one of the reason’s I loved this pasta so much when we had it. You’ve got to try this. Serve it with some good crusty bread and a green salad and you’ve got yourself an amazing meal! 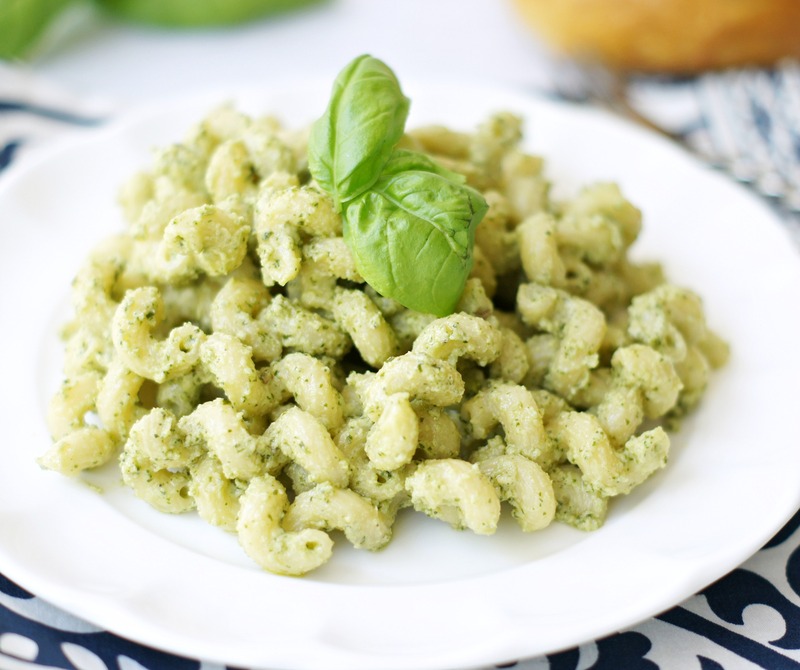 Homemade pesto is so easy to make, but you certainly can use store bought to make this dish even quicker and easier. 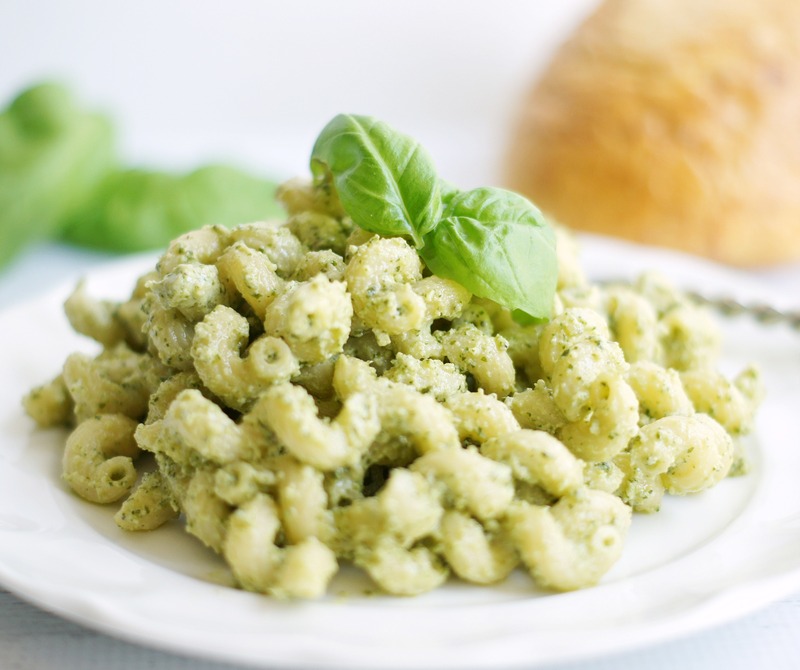 If you do use store bought pesto, you will need about 1 cup. Cook pasta, according to package directions. In the bowl of a food processor, combine garlic, pine nuts and basil. Pulse a few times until combined. Add the olive oil slowly while the food processor is running. Scrape down the sides of the processor, add the grated cheese, pulse again to blend. Add salt and pepper to taste. Set aside. In a large skillet add all of the pesto, half-n-half and whipping cream. Stir over low heat until combined and heated through. Toss in cooked pasta. Continue to cook over low heat, stirring occasionally for about 5 to 7 minutes until pasta has mostly absorbed the pesto cream sauce. Sprinkle with Parmesan cheese. Serve immediately. This looks delicious! If I want to use prepared pesto, how much do you recommend I use? Thank you! Hi Jocelyn, use about 1 cup prepared pesto. Hope you love it as much as we do. 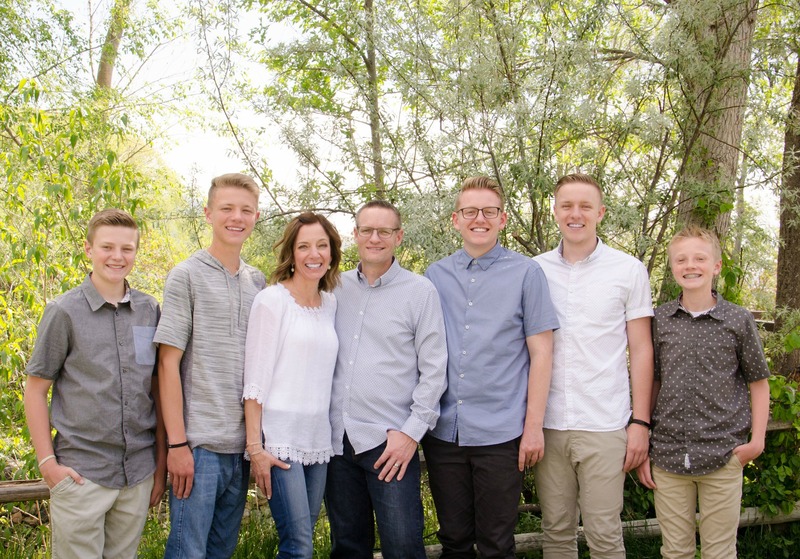 Thank you, Jodi! I’m sure we will love it. This looks fabulous! 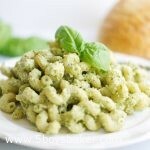 I have a little autistic boy who loves the noodles and company pesto cavatappi w/out the veggies. I definently need to try this. I think he will love it. Thank you for posting this. I always look forward to your weekly menu every Monday. Thanks so much Jodi. Thanks Tammy and I hope you have a chance to this for your son and I really hope he loves it. My boys absolutely go crazy over this stuff! Thanks for taking the time to leave a comment. Take care. I have been making a similar recipe for years. I always have homemade pesto frozen so I can make it for a quick meal for guests and I add roasted shrimp on top – looks like you slaved for hours. A great recipe – thanks for sharing! !